Thank you for dropping by! I live in a town called Lithgow, a two hour drive west of Sydney, Australia, up in the Blue Mountains. I've had my own engineering company for 17 years now and i've been single for 10 years. Time for a change but there are not many single ladies in Australia, so i'm looking overseas. Please feel free to contact me if you would like to find out more about me and if you would be interested in moving to Australia. 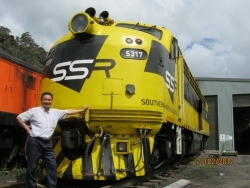 Volunteer chief engineer on heritage trains, ships, military forts and associated museums. Also enjoy travelling, nature - mountains and beaches, picnics, camping, movies, and bushwalking. Not into football or watching sports on TV sorry.